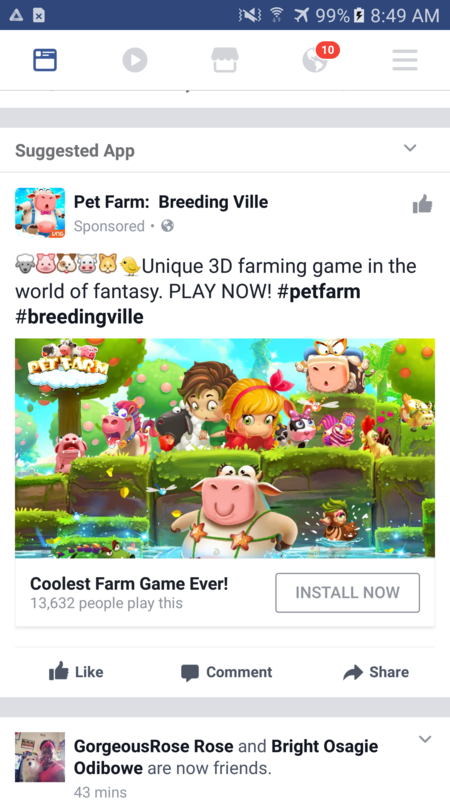 Crazy to play the best farming game with animals! Dare you to try Breed Animal Farm game! Cow + Chicken =? Pig + Sheep =? Cat + Dog =? Duck + Rabbit =? BREED ISLAND FARM IS A MAGICAL 3D WORLD WHERE YOU CAN: ★ EXPLORE distant lands to FIND and RESCUE cute pets ★ BREED & EVOLVE to collect 100+ rare ANIMALS ★ PLANT, GROW & HARVEST your favorite fruits and vegetables by innovative way ★ TRADE valuable materials with adorable farmers & villagers around the global Sky ★ Sail in sea and ocean to bring home generous REWARDS by Airship ★ CUSTOMIZE the farm & BUILD dream beautiful ville to express your own, unique style ★ EXPAND your garden into unique shapes with each precious cube addition STORY: The story begins in a country land in the sky paradise. Here the Giants were held captive for their wickedness, by those we no longer know. One day farm, the Beanstalk grew too high, it ripped apart this holy lockup. The way down to our peaceful land once again unfolded. Rapidly the Giants raided down on earth, bringing along nothing but havoc. Lively forests and tranquil villages were all devastated under their ravage. There was no other place to hide in town. Like a cool cowboy, Jack threw out the Magic Beans which he had hidden to get everyone to be safe from Hay Island zombie. Guess what’s coming down there way? Animal Paradise Village, now ripped apart into millions of Sky shards. These seem to bring hope to these new poor inhabitants. And now, island is home- a new story begins! Let's join Jack's amazing exploration with a simulation world! CUSTOMIZATION: Create your house in the sky with this mystery Island Paradise. Make shapes & amazing things with hundred types of 3D Cubes. Build paradise & decorate beautiful farm island to express yourself with unlimited creativity. PLANT: Harvesting requires a little skill. Do it fast & get more products. You will even need to reshape your farm land to suit your developing skills. Love sugar cubes? Crops, Corns, Strawberries, Carrots, Tomatoes, Jam… are shaped into cubes that look really fun, cute and adorable in country. FEED & LEVEL UP CUTE PETS: Enjoy a hey day with naughty animals . Beware! They can be free to wander where they like. They might even get lost above the cloud. Feed more, more gold. Evolve to own a zoo with 100+ unique animals (pig, cow, chicken, sheep, cat, rabbit, ... & a dozen of rare & anomaly animals) & get more coins Remember to let your animals go to the forest to get animal evolution &wait to see the secrets unfold with favorite farming game QUEST: Start a paradise day with 100+ kinds of quest: main quest, daily quest, Airship delivery. Some quests are hard to reach. Breed animals, more quests will follow VENTURE TO MYSTERIOUS ISLANDS: Glacier: Digging deep into snow, find many treasures Mount Cylinder: Under the lava flows are countless treasures Silent Sand: Explore the ancient ruin & discover hidden treasures Celestial Ocean Paradise: Unlock Airship & earn numerous rewards from filling its cargo Moonlight Lake: Seek the underwater treasures to complete Airship Sky Cavern: Unlock to breed Rare Animals Discover more island adventures with Volcano, Iceland, King, Seaside, Hay Bay, ... Add Breed Animal Farm into Top favorite farming games. Join Halloween event & be cool farmer with family at: https://www.facebook.com/BreedAnimalFarm/ Play animal breeding game, be happy with new friends. Live everyday as a farmer in farm paradise with Animal Farm Village!